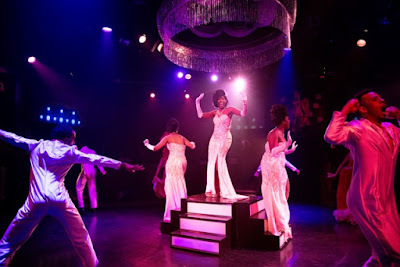 From the moment the proverbial curtain was raised at Toby’s the Dinner Theatre of Columbia for the start of Dreamgirls, there was a burst of energy that was unabated throughout the nearly three hour production. This force is evident in the lightning fast and efficiently executed scene and costume changes, soulful rhythm & blues and pop music, and the enthusiastic singing and dancing by the large and talented cast who perform like their lives depended on it. 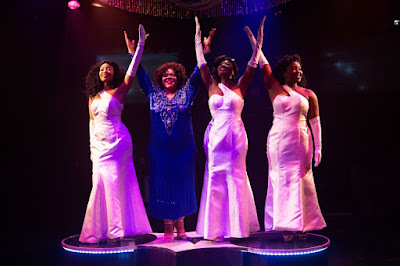 Dreamgirls tells the fictional story during the 1960s and 1970s of three friends from Chicago who wanted to make it big in the music industry. Their rise to stardom and the inevitable professional and personal conflicts closely resemble that of the Shirelles and the Supremes. Effie White is the lead singer of the Dreamettes who has a plus-size figure and a plus-size talent. C.C. White is her brother who writes music for the group. Deena Jones is the beauty who eventually takes the lead vocals for the later-named Dreams. Lorrell Robinson is the group’s peacemaker. She is in love with James “Thunder” Early, an R &B star for whom the Dreamettes sing backup. Curtis Taylor Jr., the manager of the group, is the hub of the story’s drama and tension. With book and lyrics by Tom Eyen and music by Henry Krieger, Dreamgirls first opened on Broadway in 1981. 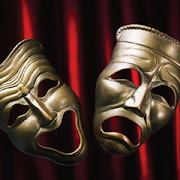 The production was a smashing success winning six Tony Awards. A successful movie that was adapted from the show opened in 2006. The lively and at times intense production at Toby’s was ably directed by Kevin McAllister while Shalyce Hembey choreographed the vigorous dancing. Under musical direction and orchestration of Ross Scott Rawlings, the seven-piece orchestra sounded lush as usual. Inventive props are on display, and the creative scenery making full use of Toby’s in-the-round stage, designed by David A. Hopkins, offers a place for the projection of images—some actual, some abstract— on the walls surrounding the stage to augment the production. The period costumes besides a wide array of sports clothes and casual wear feature stunningly colorful show gowns with feathers and loads of wigs for the female singers and splendid matching formal suits for the male singers, all designed by the incomparable Lawrence B. Munsey. There must have been a thousand such costumes pieces worn by the company, but I stopped counting at five hundred. Lynn Joslin designed the lighting which is a step above the norm seen locally and may have been the most creative use of lighting at Toby’s in my memory. With so many rapid-fire scene and venue changes, the stage has to be lit in various corners with accompanying fade-outs. The work of the technical crew in general is outstanding, and it includes the excellent sound system designed by Mark Smedley. With the fine work of the technical crew as support, the majesty of this high-octane production revolves around the performers and the music. Bryan Jeffrey nails it as James “Thunder” Early and instantly becomes an audience favorite. He plays Jimmy, the soul singer, with the intensity of James Brown that Curtis was trying to mold into the next Perry Como. His performance spotlighting boundless energy, comedic moments and style is a highlight of the show. Anwar Thomas as Marty, Jimmy’s manager, is also on target with solid acting and performs well in several songs. There are several sensational production numbers throughout in which Ms. Hembey’s precise rhythmic choreography is on display. This is especially evident in such numbers as “Goin’ Downtown,” “Steppin’ to the Bad Side” and the reprise of “Dreamgirls” all executed flawlessly by the spirited ensemble. Dreamgirls depicts the many highs and lows of the music business in the mid 1960’s. The personal sacrifices of the stars, the payola, the cutthroat nature of the managers, the sexist and racist carryover from the Jim Crow era, come into focus. Toby’s sizable talented cast will entertain you with a fusion of rhythm and blues, soul and a new pop sound from an era a half century ago, and the superb technical crew creates a dazzling spectacle worth experiencing. It is highly recommended. Running time. Two hours and fifty-five minutes with an intermission. Dreamgirls at Toby’s The Dinner Theatre of Columbia runs through November 12, 2017. For tickets and information, call 410-730-8311 or visit tobysdinnertheatre.com or ticketmaster.com.